Halter part of a 2-part halterbridle. The Deluxe Endurance Halterbridle is a two-part bridle that offers the option to quickly remove the browband and attached bit while leaving the halter in place. The process is only a simple release of the hooks on the browband. 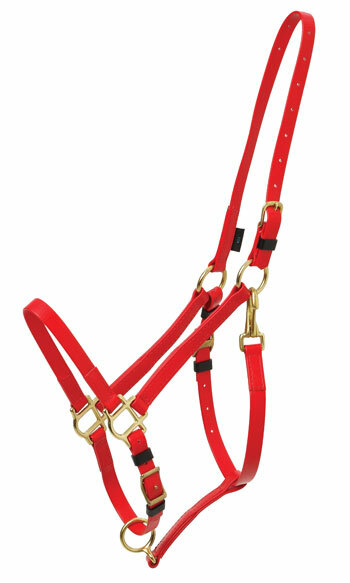 Because the bridle and halter are both available in a wide variety of color options, you can create your own unique look by ordering each part in a different color. All Zilco bridles and halters have solid brass fittings. The trademark Zilco webbing is a strong sythetic strapping. It has been used for decades and is known for durability, strength and colorfastness. This is not your average synthetic! Zilco's woven webbing and polymer coating offer wonderful ease of maintenance. It works exceptionally well in ALLweather conditions, staying soft and comfortable for your horse and looking fabulous. The Zilco Arab/Full size has been designed to fit Arabian or Cob type horses and is available in all colors. A larger Full/Oversize is always available, in BLACK only. NOTE: Zilco has recently switched to ALL stainless steel hardware. Brass hardware will only be available until our stock runs out. We are out of brass in some colors. If you would like specific hardware or have any questions regarding availability, please call us at 1-800-759-7637 before you place your order.